I have mentioned my gym a couple times, most notably right when I arrived at Coastal. At the time I was so impressed with the practically brand new facility that I couldn’t wait to get started with my regimen. After ten months of putting in my 6 a.m. Monday-Friday workouts, my sentiment has not changed. I love working out at the HTC Center and consider myself lucky to exercise in a first class gym. After nearly a year, it is time for some updates and evaluations. When I left the University of Montana, I looked back fondly on the relationships I had made with people solely because we saw each other at the gym every day. I mentioned how I hoped the same would happen at Coastal Carolina. It has. 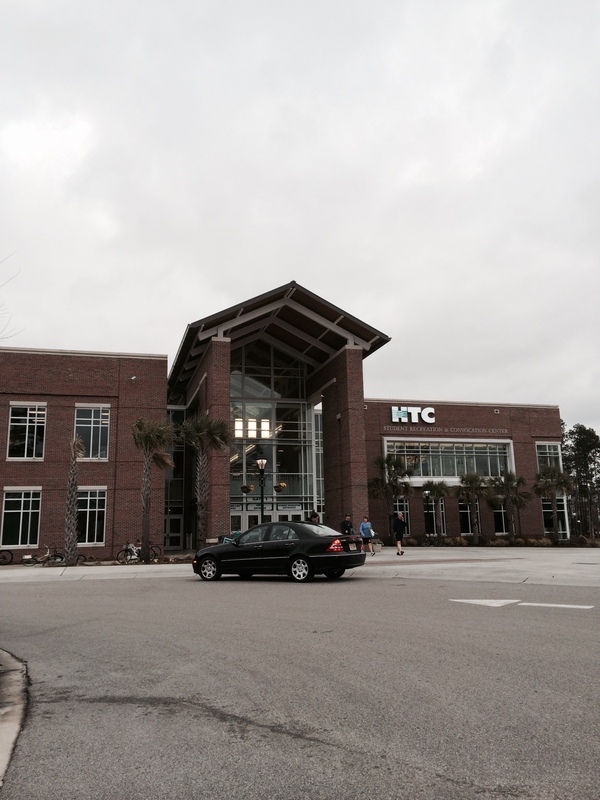 Over the months I have worked out in the HTC Center I have met professors, staff members, and students. Several of these people I am on a first-name basis with. The center’s director is around a lot, even when it is during the 6 a.m. hour. We have become very well acquainted. I have locker buddies that I talk to. I have had people come up to me in the middle of my workout and introduce themselves. I have connected with many of the student workers, but that is worth its own paragraph. 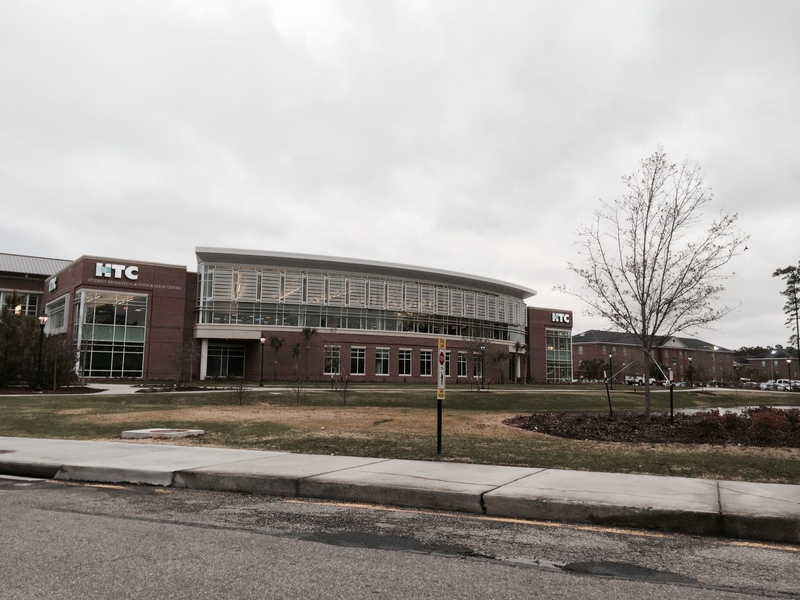 This is the very front of the HTC Center…my gym. The rec center student staff is absolutely amazing. Jody Davis, the director I mentioned above, has done a fabulous job of hiring and training his student employees. The word “professional” is what comes to mind when I think of the young men and women who serve at the welcome desk and monitor the weight room floor. I have literally pulled a couple outstanding students aside and told them I was going to feature them for #CCUfamily, completely bypassing the nomination process. Funny things happen too. Last week one of the new floor attendants came up to me and asked if I was a foreign language professor. I responded that no, I wasn’t, I was a staff member. I asked her why she thought that. She told me it was because I looked foreign. It made me laugh. A look at Coastal’s gym. I took this photo at around 11 a.m. on a Monday. I really appreciate the fact that I don’t have to pay for a membership. I equally appreciate that I don’t have to pay for towel service either. Each morning I pick up a big fluffy black towel to shower with. The facility’s showers are nice with water pressure about 20x greater than what I have in my apartment. Speaking of towels, the HTC Center probably owns about a million workout towels that you get to use to wipe off with during your exercise. Adding to the resources to combat sweat, there are numerous damp disposable towel dispensers around the weight room floor to wipe down equipment after use (or before use). I always despised spraying disinfectant into an old towel and scrubbing. A side view of the HTC Center. The large windows create great views. As far as the equipment offered, I have more than what I need. Machines and free weights are top notch. There are more than just a few benches to use. Thankfully they have an indoor track. A floor attendant once told me nine laps equaled a mile but just to make sure I always run ten laps or 20 laps based on whether I am running one or two miles. The direction you are supposed to run on the track never changes so you never have to worry about whether it is an even or odd day. One thing I do notice…far less people use the indoor track at Coastal than at Montana. Many times I am the only one running on the track and I think people look at me like I am crazy for completing my cardio in such a boring fashion. 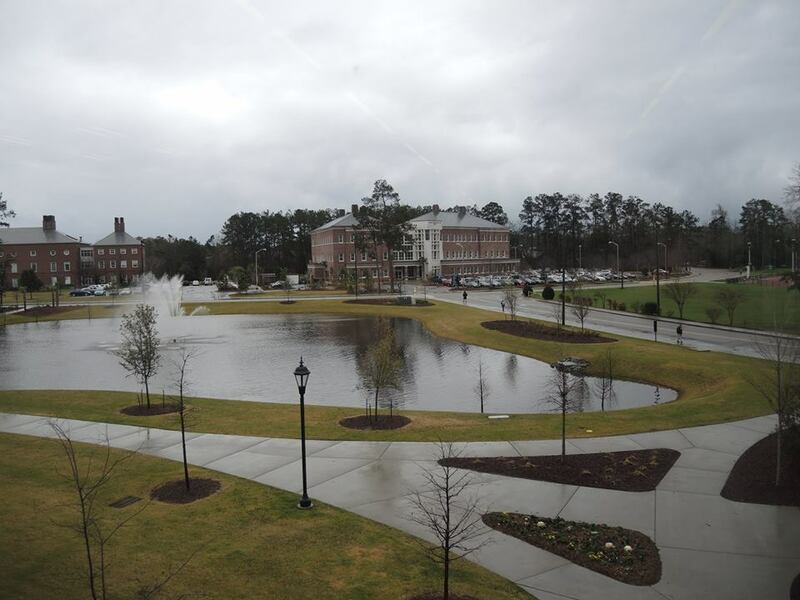 I took this photo directly from one of the large windows in the HTC Center. Each morning I watch the sun rise while doing my sit up routine. 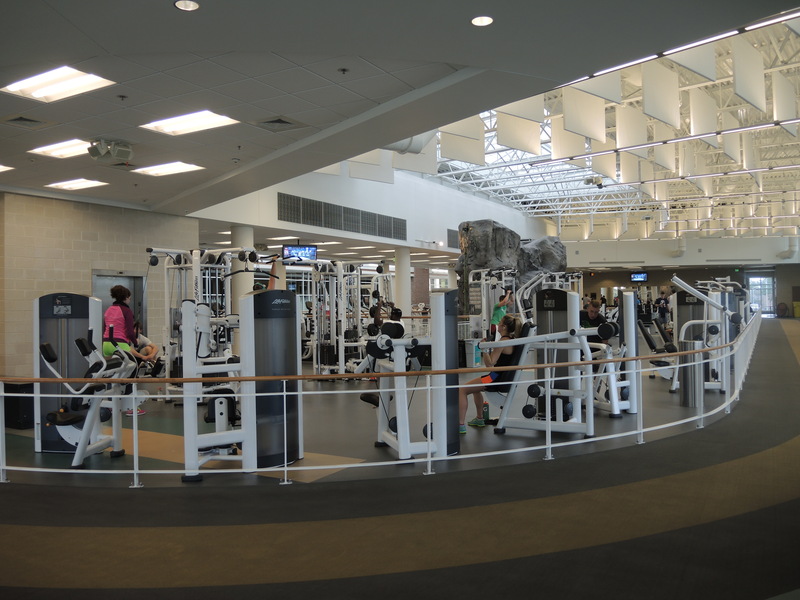 The HTC Center comes with a climbing wall, several rooms for fitness classes, ping pong tables, and drinking fountains where you can actually slurp up an adequate amount of water. You type in your Coastal ID number and scan your hand to enter through the facility’s gate. 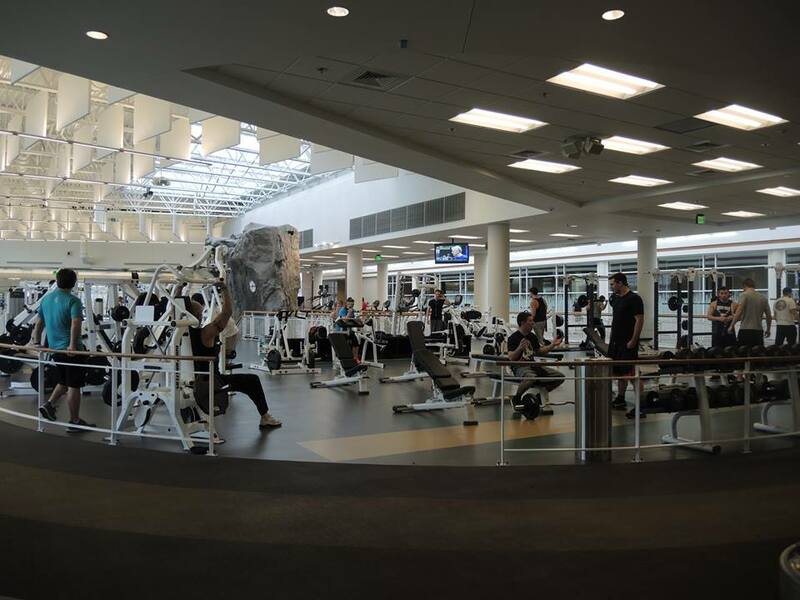 Televisions are located throughout the whole floor as opposed to just on the cardio equipment/cardio area. Each morning I watch “Sportscenter” while getting my pump in. Another look at the gym with a good view of the track and climbing wall. Now to the music. I have said before that when I work out, my thoughts are my music. I don’t use a personal iPod and I am not dependent on whatever the gym I am at is playing. I enter my own zone and block the external sounds out. With that said, I do at least notice what is being played through the facility’s speakers. At the HTC Center they have a very clear, volume-sufficient system. It can be a role of the dice though when it comes to what is being played. Depending on the day, I routinely hear mainstream pop, country, old school hip-hop, and classic rock. What usually seems to win out though is a station that plays a mix from the late 1990’s and early 2000’s. Once in a rare while though, a station that specializes in techno type mainstream remixes will be blasting and on these days (and these days only) I allow myself to enter into a trance. Finally, time to address the crowds. As mentioned, I work out in the early mornings. There is a core group of us, probably around 15 people, who show up every single day when the gym opens up. Depending on whether it is a Monday or a Friday, you will see an additional influx of about 10-30 people. Because of the size of the gym and the equipment offered, it never gets crazy early in the day. Us morning people have it very good. I have worked out a couple times during the lunch hour when I returned from trips and let me tell you, the people volume is turned up a couple notches. I have heard the traffic reaches an insane level during the evening…I have yet to experience that and have no desire to do so. Working out in a place where you are comfortable and feel welcome is important. Luckily for me, both of these needs are met at Coastal Carolina University. I love the HTC Center and can’t wait for my workout tomorrow! Don’t Blink. This entry was posted in Uncategorized and tagged Coastal Carolina University, gym at Coastal Carolina University, HTC Center, indoor track at HTC Center, Jody Davis Coastal Carolina University by brent. Bookmark the permalink. Thanks for enjoying one of the many perks we have working at Coastal Carolina University- the gym and its amazing staff!! You have such an attitude of gratitude and it is through this lens you see things with a great perspective!! !